Bees aren’t usually considered pests. They play a key role in helping flowers and crops reproduce, and some even make honey. Often, it won’t do you any harm to have some bees in your yard or garden. Problems arise, however, when bees establish a home on your property. A colony of bees can take up residence in your roof, the walls of your house, a tree, inside a shed, or in your backyard – and with a large number of bees nesting on your property, you face three major health risks. Although bees generally don’t reach the levels of aggression displayed by hornets or wasps, they can act aggressively in defense of their nests or hives, leaving you with frequent bee stings. What do they perceive as a threat? Any contact made with the nest. If you accidentally step on it, knock into it, or expose it, they’ll treat you as an aggressor. Activity near the nest. Bees are especially sensitive to quick motions. For example, if your kids are running around in the vicinity of the nest, the bees may act defensively. Loud noises. Lawn mowers, leaf blowers, playful shouting and shrieking, and music played outdoors can aggravate bees and make them behave more aggressively. It’s also unpleasant to have a large number of bees on your property. Even if they don’t treat you as a threat to their nest, the likelihood of a painful encounter increases. They’ll be attracted to your food and drinks, and you may wind up getting stung after accidentally stepping on them or swatting them away. Even if you don’t have a strong allergy to bees, their stings cause suffering. Bee stings are painful and can lead to swelling and red marks. This is because the stings contain a toxin – and if you suffer multiple stings, the accumulation of toxins may result in a fever, fainting, convulsions, and other serious effects. Worse, when bees sting, they release a pheromone that encourages other bees in the hive to attack you. It’s possible you’ll face the risk of hundreds of stings. If you try to flee, there’s a chance the bees will pursue you. Bee stings may require a visit to an urgent care clinic or an emergency room. Occasionally, hospitalization is necessary. 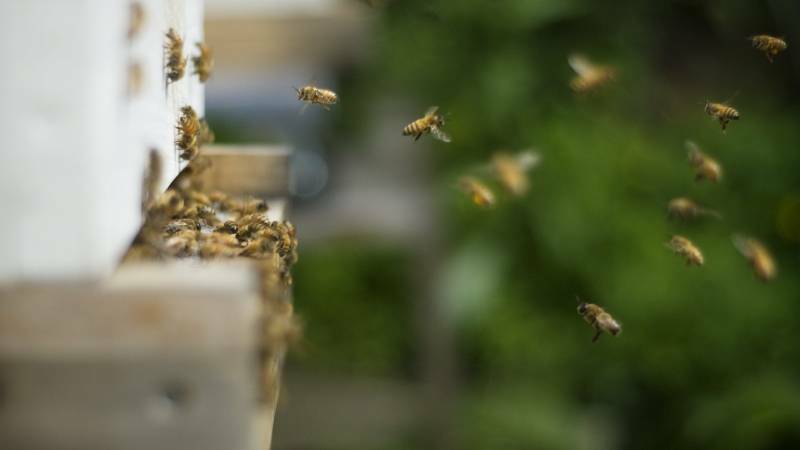 If they’re stung too many times or have a strong bee allergy, people are at risk of dying. Many people don’t know if they’re allergic to bees. If they’ve never experienced an allergic reaction from a bee sting, the possibility may not occur to them. They may also not be aware of the effects of anaphylaxis, the powerful allergic reaction that demands immediate medical attention and may lead to death. Your throat and tongue swell up. You break out in rashes and hives. You become dizzy and weak or lose consciousness. In response to an allergic reaction, people need to quickly make use of a kit containing an epinephrine injection and other medications, and they require subsequent emergency care and evaluation from medical professionals. For prevention, they may want to undertake immunotherapy, a long-term treatment that can decrease the severity of allergic reactions to bee stings. Another critical preventative strategy is to rid your property of beehives. When there aren’t any colonies of bees around your home, you’re much less likely to suffer a sting that compromises your health and puts your life at risk. What happens if you have a neglected or abandoned hive on your property? The remains of the hive and any accumulated wax or honey will attract pests, particularly ants, mice, and rats. Once they arrive, they’ll try to take over your home. Rodents spread disease through bites, through their excrement, and by carrying ticks and other pests. An invasion by rodents or ants disrupts the cleanliness and order of your home. These infestations lead to anxiety, stress, and poorer quality of life. You’ll stop feeling at ease in your own home. Once the pests have invaded, you’ll have a hard time uprooting them. The thorough removal of a hive is a key way to lower the risk of a home invasion by other pests. Getting stung multiple times. Larger hives are especially dangerous. Suffering injury or damaging your property as you try to reach a hive that’s difficult to access. Failing to complete the job thoroughly. You may wind up leaving parts of the hive behind or neglecting to take the necessary steps for preventing the formation of a new hive. Professional exterminators have the proper equipment, safety gear, and training. They understand the differences between various types of bees, including where those bees are most likely to form their homes. They may also be able to remove bees from your property without killing them. Furthermore, professionals can evaluate your property and point out the places most vulnerable to bee infestations. This knowledge can spare you from future problems. Don’t hesitate to research and reach out to local experts in bee removal. If you need bee hives removed from your home, start a search for local professionals today.